I don’t know whether to laugh or shake my head when I look back at myself in college, navigating how to run a wedding photography business, all the while totally clueless. I cringe at the days that I would type each client contract on a Word Document and ask my clients to print and mail it back to me with a check. The creased contracts got stored away in a three ring binder and marked with a pink highlighter, noting I had received the deposit. I jotted bookings in my Target planner, and there everything would stay - hoping that I didn’t misplace that binder or planner (or spill water on it! ); hoping that I copied everything down correctly and didn’t double book myself; hoping that my clients would remember to pay me my remaining balance, so I could crack open my three ring and write “paid in full” with a sharpie over the top of their contract (imagine me pulling this out in court!). If you’re still doing this, let me tell you, there is a better way! Allow me to introduce three little letters that make the world of a difference for not only you, but anyone who works with you…C R M.
CRM stands for customer relationship management. That just means any sort of software that helps you manage and interact with your clients. Incorporating a CRM into my business has been the biggest game changer, and I truly can’t believe I ever ran a business without one! There are a handful of CRM companies out there, and they are all waiting to make your life 100x easier! All your clients, from inquiry to final payment are right there on your home page. You’re able to see any projects you’ve booked with one glance at your dashboard. It makes it so easy to access client and project information, reference schedules, contracts, project details, etc. with just a click or two! The best part, it doesn’t let you double book yourself! Just that alone gave me so much peace of mind! Honeybook allows you to create templates for every step of the process. 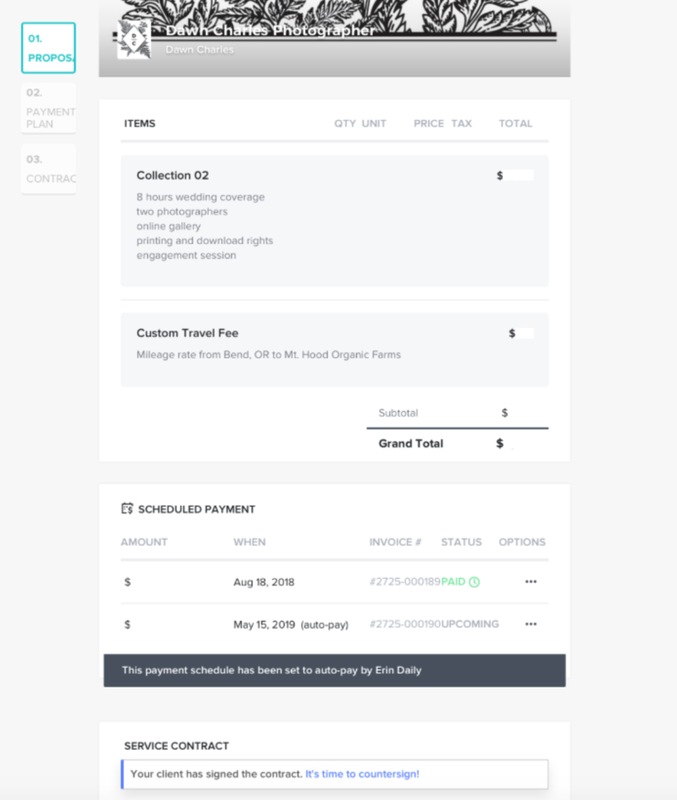 I just click a few buttons to add a new client and it automatically fills everything in with the appropriate contract, payment schedule, emails, reminders, questionnaires, etc! Once I tell Honeybook what to do, it’s basically my personal assistant, sending everything for me at the appropriate time. Gone are the days that I have to remind clients when payments are due or keep track of each step of the process. HoneyBook does all that for me! HoneyBook makes everything so easy for both myself and my client. It walks them through the entire booking process, and they can easily review their contract, sign, pay, and even set up auto pay, and ask for vendor recommendations.. It is simple and straightforward and leaves them impressed with the easy booking experience you’re creating for them! After all, they don’t need any more stress while planning a wedding! I love that i’m able to customize the experience for my clients and personalize it to my brand. The interface my clients see is complete with my brand colors, logo, and images. In addition to the visual customization, I’m able to create a workflow that creates a unique experience for my clients. I love incorporating emails to my workflow, full of helpful tips and links, a bridal handbook, and a questionnaires to get to know my clients in a fun way and learn more about their wedding details! The best part is that these all send on my behalf, without me having to actually send them or think twice about it! When I became a photographer, I was blindsided by the amount of time I was spending NOT photographing. I found myself doing hours of admin work that I wasn’t prepared for. Once I implemented HoneyBook into my workflow, I gained so much time back to spend on areas of my business that I was so much more passionate about. Now, rather than being sucked into a paperwork time warp, my days are filled with focusing on the bigger picture of my business and fueling my creativity. If you’re ready to try it and transform your life and business, click below for 50% off your first year!